At the best of times, many of us as teachers agonize over passing judgment on a student’s work in the form of marks. In a history essay, what makes one student get 72 and another 76? What does the 4 mark difference signify in terms of quality? Can quality and understanding be measured in numerical terms? And what of letter grades? Are they any better? Can we define the qualitative – and quantitative – difference between an A and a B? These and many other questions may assail us as we make the move from marks to grades. The Central Board of Secondary Education (CBSE)’s new mandate on continuous and comprehensive evaluation requiring schools to make a shift from marks to grades is meeting with a mixed response. While on the one hand, there is relief and even celebration, there’s uncertainty and skepticism on the other. We spoke with a few people to get a sense of how the change is being received. “It is a child-friendly system. Most of us are welcoming the move, especially in the interests of children who are not able to cope. For them, it is a big burden off their head,” says Nandita Khanna, Head of Nalanda Public School, a CBSE school in Mumbai. The CBSE’s new grading scheme will take into account a child’s participation in extra-curricular activities, life skills, attitudes and values, along with his or her performance in academic subjects. How one can award grades for ‘honesty’, ‘respect towards teachers’, ‘emotional skills’, ‘creative thinking’, ‘ability to handle criticism’ is something worth mulling over. “A teacher has to be very unbiased. She has to be able to respect opinions that are different from her own. For instance, one needs to sensitize teachers as to what constitutes ‘respect’ and ‘disrespect’ towards teachers, otherwise they may pick on certain students,” says Preeti Sharma, who currently teaches English to IGCSE students at the Aditya Birla World Academy, Mumbai but has taught in CBSE schools for four years before her current job. Sure, one can produce a list of indicators that attempt to place controls on teachers’ subjectivity, or even ensure grading by multiple teachers. However, is it even desirable to grade all of these things in the first place, and artificially produce normative behaviour? Would such grading create another kind of pressure – the pressure to be seen as a well-behaved, law-abiding, goody-two-shoes student, for without it one’s grade sheet would make a sorry picture? I am reminded of value education and moral science classes in school, where we wrote about values in daintily decorated books with pictures of Mother Teresa, Mahatma Gandhi et al. Teachers were content to see pages filled with quotable quotes, newspaper clippings, and high-sounding virtuous lines of prose or poetry. How can one ensure that grades reward values-in-practice, and not values-in-lip-service? 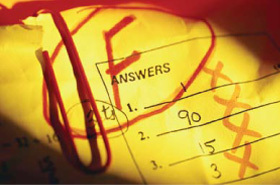 This issue is of course not unique to grades but affects assessment standards and practice in general. The switch from grades to marks necessitates a change in teachers’ attitudes as well as administrative procedures. And this change can be unsettling on several counts – the subjectivity involved in awarding a grade, the maintenance of elaborate records, working with colleagues to mutually decide upon a grade, giving up the idea of using a number/mark to sum up a child’s performance, and the sudden increase in workload. Any teacher training programmes that seek to initiate teachers into the new grading system must take these issues into consideration. While one can make all possible attempts to ensure smooth sailing into a new system, as is the case with everything new that is introduced, there are bound to be doubts and questions. Even resentment. Among teachers, parents or even students. These are legitimate concerns, and the sharing of them ought to be encouraged. It is only through open discussion that all stakeholders will get a fair chance to express where they are coming from, and to negotiate a new system in a healthy manner. The author is pursuing an M.Phil. in English Language Education. He runs People in Education, an online group connecting people and sharing resources. He can be reached at chintangirishmodi@gmail.com.